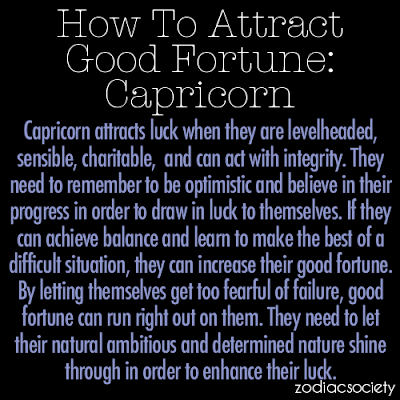 Capricorn: How to Attract Good Fortune | Capricorn Life - Capricorns Rock! Capricorn attracts luck when they are levelheaded, sensible, charitable and can act with integrity. They need to remember to be optimistic and believe their progress in order to draw in luck to themselves. If they can achieve balance and learn to make the best of a difficult situation, they can increase their good fortune. By letting themselves get too fearful of failure, good fortune can run right out on them. They need to let their natural ambitious and determined nature shine through in order to enhance their luck.